Anna Garamszegi is a registered Heritage Advisor and has worked as a consulting archaeologist since 2016. Anna graduated from a Bachelor of Arts (Honours) in 2014 at Monash University with a focus on Australian and Papua New Guinean Indigenous archaeology. Anna’s specialisation is faunal shell identification and quantification, and her Honours thesis focussed on the analysis of shells from an archaeological site in southern Papua New Guinea. Anna has fieldwork experience in both Indigenous and historical sites around Victoria, and is trained in fine-grained excavation techniques. 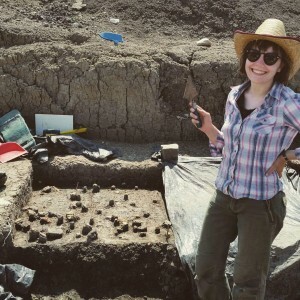 In 2017, Anna participated in the excavation of a Neolithic site in Tasnad, Romania, in affiliation with University College London. Anna also has archaeological laboratory experience, having worked as a research assistant for a variety of Australian and Papua New Guinean projects since 2012.